JoAnn Stangel, 80, of Cumberland, passed away on Thursday, March 28, 2013 at Allegany Health, Nursing and Rehab Center JoAnn was born in Cumberland, Maryland on September 13, 1932 to John Joseph Stangel and Katherine Elizabeth (Cheshire) Stangel. She was a 1950 graduate of Allegany High School, 1952 graduate of Potomac State College, and 1954 graduate of West Virginia University. 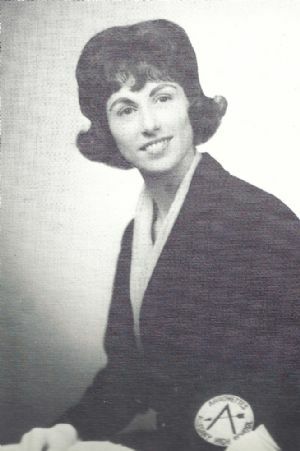 JoAnn taught at Beall High School in Frostburg, Maryland and moved to Ardmore, Oklahoma to teach, then moved to Dallas, Texas and continued her teaching career, and then returned to Cumberland and taught at Allegany High School from 1964-1973. While at Allegany High School in 1965 she formed the award-winning Arrowettes Drill Team. She modeled the team after the Kilgore College Rangerettes where she had apprenticed with Gussie Nell Davis. She took great pride in this group; they numbered 70 plus and performed by request throughout the United States. In 1990, after teaching for several years in Pittsburgh, JoAnn returned to Bishop Walsh High School and taught from 1990 to 2012. Another great source of pride and success was her involvement with the Spartan Theatre at Bishop Walsh School. Stangel's love for theatre started at a very young age, encouraged by her parents. Her father built a stage for her in their garage. She brought musicals to the stage at Bishop Walsh for over 20 years and loved every minute of it. JoAnn is survived by her brother, Gregory J. Stangel I, of Cresaptown, MD. A memorial mass will be held at Bishop Walsh on April 17th, 2013 at 10 a.m. Note: JoAnn Stangel was also the 1967 Allegany High School class co-advisor, and also supervised numerous theatrical productions at Allegany High School during her tenure there. In her later years she organized community Broadway show bus excursions to New York to benefit the Cumberland Theatre and Spartan Theatre.